For those that have seen my Gold Medal List, you know I am a sucker for compelling characters and intricate plots. 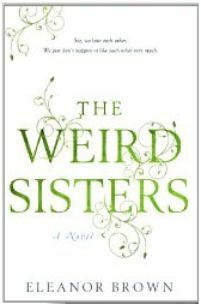 The Weird Sisters by Eleanor Brown, had a decent plot and amusing characters, but what made this a great read was the fascinating voice used by the author. The Washington Post provides a detailed description of Ms. Brown’s novel, so I’ll keep my synopsis short. Three weird, thirty-something, confrontational sisters, beckoned by their Shakespeare-quoting father, return home in varying states of disgrace to nurture their mother during her cancer treatments. But, much like a large family gathered for a two-day weekend, the 320 pages were too brief for us to do more than get a cursory “how’s life going” from each of the characters. The mother’s illness, a potentially strong emotional event, were an unsentimental sidenote to the dramas unfolding for Rosalind, Bianca, and Cordelia. Although the plot and characters provided enough entertainment to keep my attention, it was the author’s compelling voice that I found most riveting. Ms. Brown uses the plural first-person when shared memories are involved; but uses the third person for each individual’s story. The Washington Post writes that the plural first-person “subtly argues for their sisterly union even in moments of strident confrontation.” I agree with the Post, but for me this artistic choice was much more than a backdrop for sisterly union. I felt as though I was at a Shakespearean play and the narrator, taking the stage, leaned in; we felt our bodies move forward, and from the narrator we heard the truths behind the barbs. I wondered though, wasn’t this technique used by William Shakespeare? Did the author intend to remind us of the Bard’s plays? Although I found no mention of this being Brown’s intent, I wanted to know more about whether this was a device employed by Shakespeare. To get my answer I called on Shakespearean expert and actress Elizabeth Rentfro.1 Ms. Rentfro said that the use of the plural first-person is found in William Shakespeare’s Chorus. Unlike a Greek Chorus, a Shakespearean Chorus is a single character who addresses the audience. Shakespeare used an iambic pentameter version of the technique in Henry the Eighth, Romeo and Juliet, and numerous other plays. The fact that Eleanor Brown used Shakespeare’s technique to write a story about women whose childhood had been heavily influenced by the Bard was delightful. 1) Elizabeth Rentfro has an MFA from Mary Baldwin College and is currently appearing in Rosencrantz and Guildenstern are Dead with the Promethean Theatre Ensemble at the Athenaeum Theatre in Chicago, IL.